Tim is the Hearthstone expert at PC Gamer, but he isn't in Boston at PAX East. I'm in Boston at PAX East, so when I went to talk to game director Eric Dodds about Hearthstone's upcoming Blackrock Mountain adventure, I naturally consulted Tim for questions. Tim wrote a lot of questions. Tim wrote too many questions for me to ask, never mind memorize in 10 minutes—yet the show must go on, so I present to you: Tim Clark interviews Eric Dodds by proxy. It looks like me there at Blizzard's event last night, but it's actually Tim. Just squint a lot. 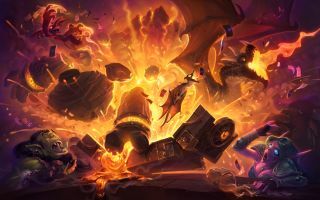 We (by which I mean Tim) have lots more questions about Hearthstone's new adventure, and we'll (Tim) will be getting more answers as soon as we (Tim) can.